I graduated from Appalachian State in 1982. Worked for Burroughs/Unisys Corp for 8 yrs and have worked the past 29 years for the Carolinas HealthCare System (Atrium Health) in Charlotte. I married Susan Howze (Dude's sister) in 1984. We have two kids, Laura and Mitchell ages 30and 24. We no have 2 grandkids Madyson (8) and Jordyn (3). We lived in Charlotte until 1989 and then moved back to KM to be closer to family. I enjoy taking my kids and grandkids to our generation of concerts. We have seen the Stones, Clapton, Journey, Aerosmith, 38 Special, REO Speedwagon, Three Dog Night, Eagles, Seger, Van Halen, Grand Funk, Lynard Skynard, Hank, and Elton John. I still enjoy basketball and watching the kids play sports. My daughter (Laura) graduated from KMHS in 2006 and Mitchell graduated in 2012. Mitchell graduated from UNCC in 2015. I am too out of shape and big to play anymore but I love to go to any sporting event. I loved playing basketball and tennis. In basketball at halftime all of Belvedar Circle would be in the locker room with coach Blalock. Listening to "Super Chicken", Eggi (Glenn Ellis) and RA Bell go at it on the bus was classic. Who can forget "Flinto" and Vernon Bell. Great times with stories that last a lifetime. Alan Cloninger updated profile. View. Alan Cloninger has a birthday today. 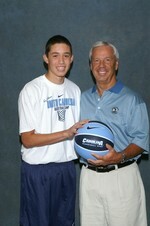 Mitchell (14) with Roy (2008).